There are many chances of meeting an actor or singer when you live in the city near the biggest media networks. There are lesser chances of meeting a painter or a musician as you go about your daily commute to work. I have always admired people in the fine arts and getting the chance to meet one was a chance I could not pass over. The artist in his modest work space. Mr. Leo Meneses was the artist we were going to meet with in his hometown of Pililla, Rizal. I've always wanted to have a conversation with an artist and learn about what inspired them to pursue their creative side, why they do what they do and many other questions that only frustrated artists like me can relate to. Travelling out of town was a good excuse to get away from it all and meeting an artist in his own home was such a privilege for me. So off we went early in the morning, from EDSA, up the steep road, on a van to Tanay, Rizal. Sir Leo, as we called him, met us at the jeepney terminal. His family will pick us up after they finish things in the market. In the meantime, he told us about the recent events that had a major impact on their family. It delayed his time to paint, but he didn't stop painting and continued on. He had a deadline to adhere but he wasn't worried about delivery. Creative people are often stereotyped as eccentric and usually have sudden outbursts of emotion or experience emotional or mental breakdowns when something out of the ordinary happens in their lives. It was refreshing to meet an artist who disproves this right on our first meeting. He made us feel comfortable right away and we knew it would be fun talking to him later on. He lives with his wife together with their son, daughter-in-law and 2 grandsons. They were the ones who picked us up for a ride to their house in Pililla, Rizal. We arrived late in the morning so we spent the time taking photographs of his paintings; some completed, some in the middle of being completed. Sir Leo working on a painting. Sir Leo hailed from Samar where he lived on a farm. His hobby was to draw illustrations for his classmates and teachers and even for some town folks and local officials during election. He pursued his talent in college with a Fine Arts degree, Major in Painting, from the University of Santo Tomas. His professors then included Mario Parial, Bonifacio Cristobal, Wenceslao Garcia and Leonardo Hidalgo. He was not the seriously artsy type even during his college days. He recalls that they used to paint the chairs of other students who were noisy and even staged pranks just for the fun of it. He was also buddies with some of his teachers and got along with them even when he sometimes acted the delinquent student. He also took a part time job drawing sketches to cover his school expenses. A close look at one of his paintings. Perhaps his boyhood on the farm influenced his love for nature which is the theme for most of his paintings. He spent many years painting in Aroceros Park every Sunday after he graduated from UST. The park was one of the last living forest in Manila and when Mayor Atienza was planning to demolish it to make way for a new structure, he was one among many groups including artists, who rallied for its preservation. In an interview about the demolition, he expressed his anger about the situation. I am only a painter, but I know that this place is special. When I first discovered it two years ago, I was happily surprised that in Manila's underbelly there is a forest,... But now, it is padlocked and trees are being murdered. I am outraged. His longing for the loss of such a place inspired him to create paintings that showcase nature. His own hometown boasts of many scenic spots which he often visits. He photographs them or sketches them and then he recreates them in his paintings. One of his finished paintings. Nature in his paintings is very much alive. The canvasses were big making the scenes in the painting seem life-sized and real. Looking at one of his paintings makes you feel like you are just across the scene and you can walk forward to reach the place. Many times, we felt compelled to reach out to touch the rocks and we felt we could cool ourselves if we just reached out to feel the splash of the water from the waterfall. We controlled ourselves however, for fear we would ruin the painting. We wanted to climb the rock to get to the waterfall. I asked him what he would call his style and he describes it as "pallet knife" painting. He didn't give details but I could see how he used his pallet knife to create texture and dimension in his paintings. His paintings always had a 3-dimensional, realistic feel to them that made one want to reach out and touch some elements in the foreground. We also found out that he didn't work on one painting at a time. Instead, he was actually in the middle of working on several paintings at the time. In fact, there were some paintings that we thought were already completed but he said it was still unfinished. Scene inspired by Sonya's Garden. In one of his paintings depicting a garden, we wanted to just jump right in Harry Potter-style and follow the path to the rest of the garden. We wanted to take the whole painting home actually but we took a picture as a souvenir instead. I think of most artists as geniuses but not all geniuses are humble or easy to talk to like Sir Leo. He didn't talk to us about art theory but about real life stories, he even shared a few of his favorite jokes. We promised to use them on our friends and we shared some of our own stories and jokes too. We even talked about politics with some historical trivia sprinkled in. All through out our conversation, I felt that we would be a very interesting radio show to listen to if we went on air at that time. We also felt his genuine love for nature because it beckoned to us in all of his paintings, even the ones which only showed a close-up of a flower. Sir Leo in his working nook surrounded by the tools of his craft. We wanted to stay and talk some more and learn some more but he promised to take us to the windmills and so off we went to appreciate the view. We arrived at the wind farm in the middle of a hot afternoon. Unfortunately, the windmills were undergoing maintenance at the time and so were not moving which meant that there was no cool breeze to enjoy. But we still stayed a while and together with us girls Sir Leo also endured the heat and even took wacky pictures with us. 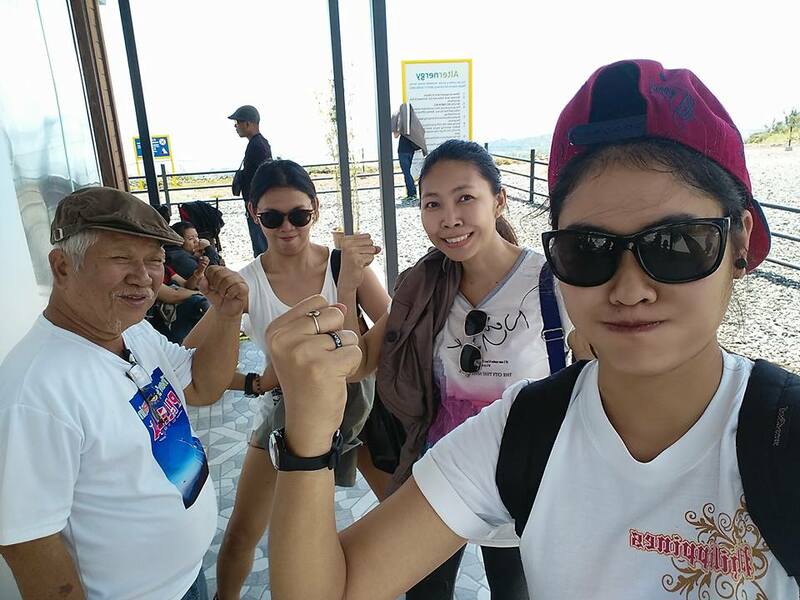 Sir Leo doing a wacky pose with Sarah, me and Jessica. 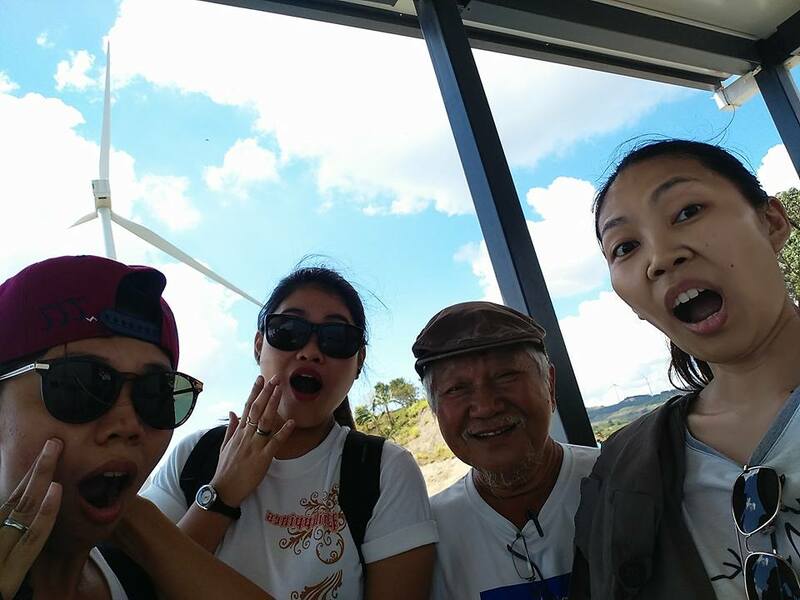 While chatting at the wind farm, we told him that he reminded us of the sensei from the original Karate Kid movie and he just smiled which made him look like the actor even more. Most artist are also not too tech savvy but he showed us his digital camera which he uses to take scenic shots. He even attempted a selfie with his mobile phone with the windmills as his background. Another wacky pose with Sir Leo. Finally, it was time to say goodbye to the windmills and to Sir Leo. He and his son dropped us off at the terminal where we took a van bound for Manila. We thanked him and promised to visit him again and check out his latest paintings. We can't call ourselves "nature" subjects but maybe we can have ourselves be the subject of one of his paintings or sketches. The pictures on this post don't really showcase the beauty of his paintings when you view them personally. But we can appreciate the real thing when he launches his exhibit at the Heart Center in Quezon City this coming April 18. You can also check out his Facebook page for his latest artworks. Just send a message to inquire about any of his paintings or if you want to commission him for a project. Quote from Art Circle Gallery article.